This is an outline of the walks that we did in 2014. For anyone wondering about the logistics for the walks: the show each evening is an ideal opportunity for people to meet each other and talk about how to help with the logistics of moving cars and gear between the start and end points the next day, or from lunch stops and other points if people are walking for half-days. The merchandise point (we’ll have CDs and t-shirts) at each gig is a good place to come and say hello if you need any help. We know from past experience that these walking tours attract a lot of friendly people and it is rarely difficult to find others to help you. We will help where we can. We want the week to be fairly organised but relaxed and we need to allow for a bit of flexibility and the inevitable moments of dealing with the unexpected! We will be available on 07973 214289 from Sunday 25th May if people need any help or advice – but please don’t call this number before the Sunday. You can email us at info@jj-rr.org at any time. Anyone who doesn’t want to walk for a whole day is welcome to start or finish at the lunch stop – or even just to to drop in at lunchtime to say hello and wish the walkers well! 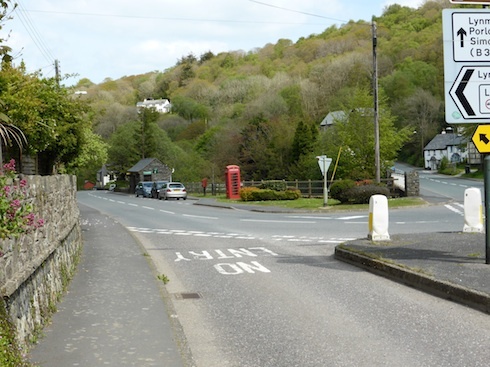 Meet 11am at the Tourist Information building in Barbrook on the A39 (see the page Barbrook meeting point for details of the meeting spot). Walk south to East Ilkerton, then continue south to Wood Barrow at 480m, an ascent of some 300m over 4 miles. We will then continue on to Breakneck Hole and join the B3358 after another mile. This gives a first section of 5 miles. The next section is 6 miles and goes south to Mole’s Chamber then south west to Five Cross Way and due west to Four Cross Way and the A399. The final section is another 2 miles into Bratton Fleming to meet lifts into Barnstaple for accommodation and the evening show at the North Devon Beer Festival. Our set begins at 8.30pm. Meet at 9am on the Barnstaple side of the bridge over the River Taw. Local knowledge recommends that we meet in the square in front of the museum. This is only a short walk from the bridge. 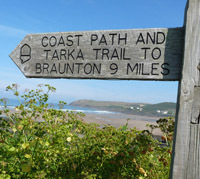 We will then walk over the bridge and follow the Tarka Trail for 8 miles to the Westleigh Inn for lunch. After lunch, we continue along the Tarka Trail by the River Torridge through Bideford and on to where the trail meets the A386 on the edge of Great Torrington. This is 7.5 miles. This night’s show is at the Plough Arts Centre which is a mile farther on in the centre of Torrington. This is a long day’s walk and so we will need an 8.30am start. We meet again where the Tarka Trail crosses the A386 then follow the trail south up the Torridge valley before looping north east to Dolton and lunch after 12.5 miles. 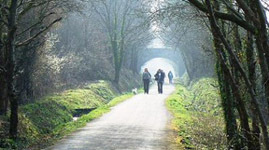 The first part is along an old railway line before following paths and lanes to the Royal Oak for lunch. This is a large pub with car parking outside. After lunch, we continue across country for another 7 miles along the Tarka Trail to Hatherleigh and the Tally Ho. This is a bit wiggly with some gentle rises so be good for those wanting only a half day walk. 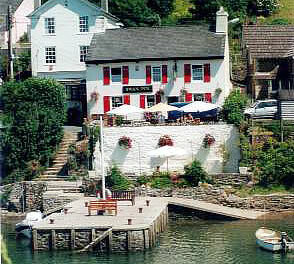 The Tally Ho is a small pub which serves good food. Please call them early if you can to reserve a table and order your food. Tonight, there will be a short set followed by a session. Another long walk and an 8.30am start from the Tally Ho. We continue along the Tarka Trail for 8 miles to Okehampton and then another 4.5 miles on to Belstone for lunch at the Tors Hotel. 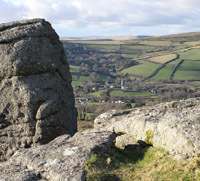 Walkers can join at Okehamption for the hilly but lovely walk to Belstone with views of Dartmoor. John should arrive at Okehampton between 11.30 and 12 noon. Meet at St James Chapel in Fore St.
Then it’s 8 miles to the bridge at Chagford. We believe that this puts us onto the original Mariners Way, the inspiration for the walk. There will be quite a bit of navigation required for this segment as we will be walking in and out of fields and lanes. This will be one of the highlights of the week seeing the moor above us. We will not stop in Chagford but get lifts to Drewsteignton and the Drewe Arms for a pint and, weather permitting, to watch local Morris sides dance outside the pub. John and the Reluctant Ramblers will perform a set starting at 8pm followed by a ceilidh and a session. We meet in Chagford for a 9am start. We will walk up onto the high moor with steeper walking and a faster pace. We start by taking the lane due south out of Chagford before re-joining the Two Moors Way at Jurston. We then climb up onto the moor turning south to Hookney Tor and Hameldown Tor continuing on to Widdecombe-In-The-Moor and lunch at The Ruggestone Inn, one of the top ten unspoilt pubs in the UK. This distance is 9 miles. After lunch, we make a steep climb out of Widdecombe and back onto the moor for another 7 miles to Holne. Here weary ramblers are invited to see the medieval painted rood screen in Holne Church, where a cup of tea and cake awaits them at the end of the day. Conservation work here has revealed a vibrant, almost intact, 16th century paint scheme and an extraordinary procession of forty original figure paintings. Conservator Eddie Sinclair, a long time friend of John, will be in the church to introduce the screen. The musicians must leave Holne at 5pm to take lifts to Totnes for the evening gig at the Barrel House. 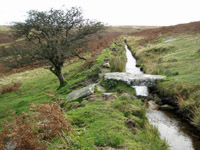 Starting at Holne at 9.30, unless the weather is very bad indeed, we follow the Two Moors Way for 16 miles up and across Dartmoor to Ivybridge. There is no prescribed lunch stop on this route. We hope to have a local guide with us for this stretch. John and Colin will almost certainly do the walk over the moor. If the visibility is poor, an alternative is to take a lower level walk and leave the Two Moors Way at Scorriton and follow the lanes down through Combe, Two Oaks then Cross Furzel to the Abbots Way. This then leads out to the Avon Dam Reservoir and down to South Brent. The route stays north of the railway line and goes west via Great Aish to Owley Corner then over the moor for a bit and down to Ivybridge. This route is 14.3 miles. The show this evening is at the Watermark Theatre and is the last show of this tour. Meet you there! The provisional meeting place and time are the Watermark Theatre at 9am. Please check with us at the show on Friday night for confirmation. Leaving Ivybridge, we follow the Erm-Plym trail to Sequer’s Bridge and continue along it until we get to Hole Farm – there we follow the lane into Holbeton. As it’s only 9km to here, it’s too early for lunch but we hope that the Mildmay Colours pub will be open for a coffee stop (to be confirmed). We then set off on the bridleway that leads to Efford House. 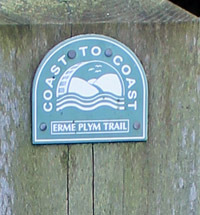 There is a track marked on the map along the Erme estuary from here to the Old Coastguard Cottages. We have been given permission to walk this path from Mr Mildmay-White, the owner of the Flete estate, for which we are very grateful. Please note that the only provision for this permission is that dogs must be kept on a lead. We also thank Amanda Pellatt of the local Ramblers group for her advice on this route. We then join up with the South West Coastal Path to Noss Mayo. There is the possibility for those who don’t want to do it all to shorten the walk by a few km at the end. The whole walk is about 17 miles. The aim is to have a surprise picnic for lunch somewhere along this route…..
We will relax this evening in the lovely Swan Inn, overlooking Noss Mayo harbour, where John and the Ramblers will perform a set and invite others to join for a session. Thanks for this – good to know we made the right choice for lunch – as you’ll see from the details for Thursday https://jj-rr.org/two-moors-two-seas-2014-walking-tour-2/, we’re already booked in for lunch at The Rugglestone! Looking forward to the walk already! Hi John & Co., decided that we can manage at least half of each day, so looking forward to joining you. Involves a bit of logistics (bus or cab back to collect the car); we’d be happy to share with others – please pass on our email if anyone’s interested. We will be joining you Wednesday night for walking on Thursday and Friday. Happy walking. If anyone has transport heading back to Chagford/Drewsteignton from Holne on Thursday and has space for a man and his dog please let me know. We’re staying outside Drewsteignton and walking to meet the group at Belstone on Wednesday and then continuing on Thursday. There doesn’t seem to be a bus that can take us back from Holne so we may have to turn back and Widdecombe otherwise. Looking forward to the walk. Is it possible to join on Sunday at the five mile point or is there a lunch stop? There’s no formal stop on this walk. This is planned as a shorter day’s walk to see the beauty of Exmoor before heading south to Dartmoor. Hi john – hoping to catch up tomorrow – is it still Westleigh for lunch? We hope to see you at the Plough if all else fails!! Yes, Westleigh for lunch. Anyone who wants to eat there – don’t forget they are asking for people to phone and order in advance (ideally today) – just to make things easier for their kitchen in coping with so many of us!